Once inserted in the common interface slot of your digital satellite receiver tuned to Hotbird at 13 degrees East, this official TivuSat Italia CAM will provide you with the necessary decoding equipiment needed to view all your favourite Italian national television channels. When ordering this item we are supplying the CAM only, you will of course need your own valid Tivu smartcard. TivuSat consists of over 30 superb Italian subscription free channels including Rai Uno, Rai Due, Rai Tre, Rete 4, Canale 5, Italia 1, LA7, Iris, Rai Sport and Rai Sat Cinema. No more loss of viewing on Canale 5, with TivuSat encryption blackouts due to programming rights issues are no longer an issue. Every programming genre including movies, sport, lifestyle, general entertainment, the arts, music, drama is covered with this package of channels. This superb package includes the official TivùSat SmarCam. When used in conjunction with a valid TivuSat smartcard (not supplied) it will provide access to all scrambled TivuSat channels including RAI HD. 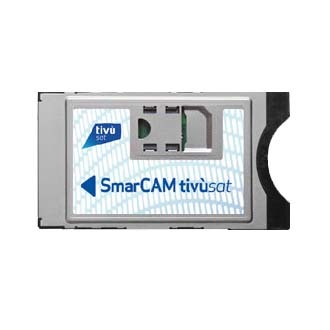 Click the button below to add the TivuSat Tivu SmarCAM Module to your wish list.